Home SPORTS It’s an All Stars, Jaguars final again! It’s an All Stars, Jaguars final again! 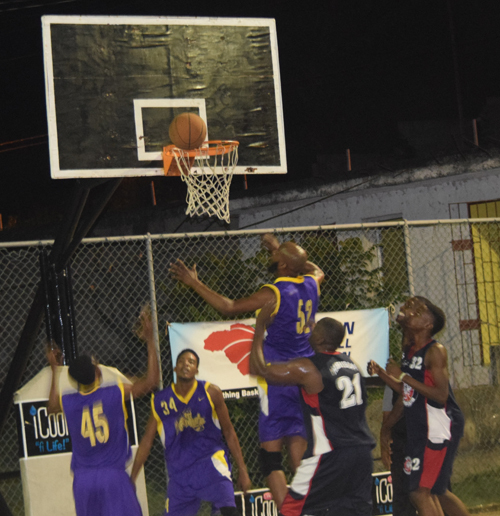 It will be another battle royal, come Thursday when perennial rivals defending Champions Catherine Hall All Stars and Granville Jaguars meet in Game One of the best-of-three Final of the Western Basketball Association iDrade/iCool Elite Basketball League at the Montego Bay Cricket club Court at 8p.m. Granville Jaguars, the number one seed, fought off the challenge of the fourth-seeded MoBay Cricket Club Knights 82-72, to propel themselves into the final for a third straight year. Mark Wright of the Knights registered a game-high 20 points, grabbed 13 rebounds, along with 2 assists, three steals and a blocked shot in a losing effort. Cleon Morgan, 18 points, and Levar Rose 17, combined for 35 points to help steer the Jaguars to a ten-point victory. The game was a competitive one as the Knights kept pace with their highly fancied rivals, with the scored tied on numerous occasions, with the half time score reading Jaguars 39, with Knights three points adrift on 36. The battle raged on between the rivals, with both trading baskets, in many instances popping three pointers at intervals to jolt the fans into excitement. The third quarter ended 58-54 in favour of the Jaguars, but with Knights still in striking distance. However, Knights suffered another fourth quarter meltdown and despite their valiant efforts, could not peg back the Jaguars, who then cruised into the final on a ten-point margin of victory. Meanwhile, Catherine Hall the number two seed sealed their berth in the final on Sunday in a thrilling semi-final match up with number three seed Holland Saints downing the Trelawny-based team, 78-55. Craig Dorman led the charge for the All Stars, posting a game-high 24 points while pulling down 5 rebounds, recording one assist and two steals. Michael Johnson was equally effective for the Saints in a losing effort, netting 23 points, grabbing 24 rebounds, while registering two steals. The pendulum swung full tilt in favour of the All Stars in the fourth quarter as the Saints, seemingly overwhelmed by the pace of the game and losing two players who fouled out, lost steam, missing numerous shots and easy layups, while Catherine Hall pounced upon every error to make them pay. The final whistle ended the Saint’s misery and heightened Catherine Hall’s joy.